This is a basically a slightly fancy cheese on toast, great for making use of leftover ends of cheeses and bread - don’t feel afraid of mixing different types together if you have a few different types of cheese in your fridge. Preheat the grill to medium. Grill the bread on one side. Put the grated cheese or crumble cheese into a bowl and beat with the milk, add the mustard and Worcestershire sauce and spring onions. Cream until well combined. Spread onto the uncooked side. 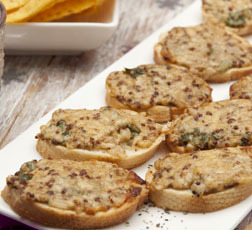 Place the toasts onto a baking tray and cook under the grill until the cheese is bubbling, trim each slice into 6 rectangle fingers, spoon a little fruit chutney onto each finger, arrange on a serving plate and eat whilst still warm. To freeze ahead:Complete the recipe up to the end of step 2. Freeze on a tray, then once frozen, pack into an airtight container, label and freeze for up to 3 months. To use: Cook the toasts from frozen and complete the recipe from step 3.